Twilight star Kristen Stewart has announced her next big project in the works. Jumping from one book based film to the other, Kristen will play the lead role of Marylou in the film adaptation of Jack Kerouac’s On The Road. The project has been in talks for years, but until recently, had always been put on Hollywood’s back burner for one reason or another. In a recent interview where Kristen appeared on Live with Regis and Kelly to promote Eclipse, the third installment of The Twilight Saga in which she returns to costar with Robert Pattinson and Taylor Lautner, she spoke about her newest project with the hosts. “And here you are making that film.” Regis Philbin said. “I know; it’s insane.” Kristen agreed. First published in 1957, On the Road is now considered a cult classic that has inspired the likes of Bob Dylan and the makers of films like Easy Rider and Thelma and Louise. The autobiographical story tells the tales of Kerouac’s travels across the United States and Mexico after World War II in his search for self enlightenment. Other stars set to appear in the adaptation include Kirsten Dunst, Garrett Hedlund and Sam Riley. Filming begins in August and we can anticipate a 2011 release. So are any of our celebstalkers fans of the classic? But it’s not a typo celebstalkers! Robert Pattinson has recently released some..information for his millions of Twilight fans about his experiences while filming Twilight Eclipse. According to a recent interview Rob Pattinson was very distracted while filming the “tent scene” in Twilight Eclipse in which his character, Edward Cullen, shares a meaningful dialouge with Taylor Lautner’s Jacob Black over a shivering, sleeping Kristen Stewart (Bella Swan). Actually the line is “Can you at least keep your thoughts to yourself”, but according to Robert Pattinson the word “fart” sounds exactly like the word “thought”. 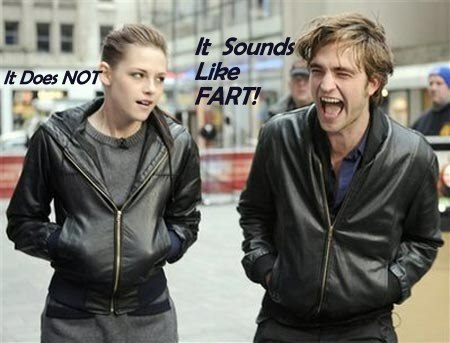 Kristen Stewart attempted to correct Pattinson, saying that the word “fart” did NOT sound like the word “thought” at all. But Robert Pattinson disagrees and couldn’t help but share all of his farts/thoughts on this with the media and his millions of fans. No word yet on how Kristen Stewart, Taylor Lautner, director David Slade and the rest of the Twilight Eclipse cast and crew feel about Robert Pattinson essentially making it almost impossible for all but the most hard-core Twilight fans not snigger all through-out one of the film’s most pivotal scenes. So what do you think celebstalkers? 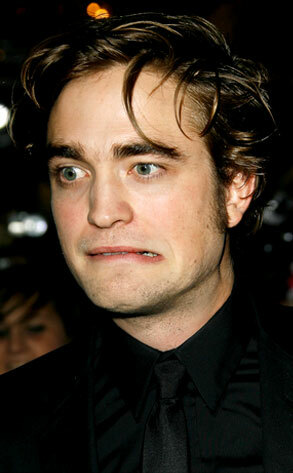 Should Robert Pattinson start keeping some of his farts thoughts to himself? Actress Emma Roberts has made a near fatal mistake and paid dearly for it! The young actress confessed on a recent appearance on the Tonight Show that she is “Team Jacob”…DA DA DAHHHH….. Apparently the actor who plays Edward Cullen, Robert Pattinson, made a joke in response and laughed about the comment. The real Edward Cullen was unable to comment because HE IS NOT REAL! Jacob Black also was not available to comment because HE IS NOT REAL EITHER! But try telling that to millions of angry, pitch-fork wielding Team Edward fans! Almost as soon as poor Emma Roberts made the statement she began to receive harassing messages on her Twitter account from the maddened fans of Edward Cullen. The comments were so vicious and so large in number that Emma Roberts has now deleted her Twitter account to escape them. Perhaps the next course of action for young Emma Robert’s to take is to force her famous aunt Julia Roberts to confess whether SHE is team Edward or team Jacob. This would no doubt lead to every adult female actress to do the same. Lines would be drawn in the sand and then two armies of wild-eyed Amazonian actresses would face off in fierce battle and settle this whole Team Edward/Team Jacob question ONCE AND FOR ALL!!!!!!!!!!! So whose side are you Really on Julia?! But seriously, we haven’t seen this type of zealotry since Simon’s dance number in Jesus Christ Superstar! If only we could encourage Team Edward fans to somehow team together to fight world hunger, just think of all of the good that they could do! But until that beautiful day, at least they can influence the world by terrifying young actresses into rejecting the latest social networking trends. We only have 8 more days til the third season of HBOs hit series True Blood begins! For those of you who are still in the dark, True Blood is based on the popular Sookie Stackhouse novels by Charlaine Harris which tell the story of Sookie (a feisty waitress) and her dealings with the supernatural in the small Louisianna town of Bon Temps. Jason Stackhouse: Sookie’s big brother, a womanizing idiot without a heart of gold (yet?) look for Jason to get into even more trouble this season! played by Ryan Kwanten. Look for these fun characters and more to be getting down and dirty in True Blood’s Season Three!